I've always had an ear for music. I've played piano since I was five having learned Yankee Doodle by ear from my father. 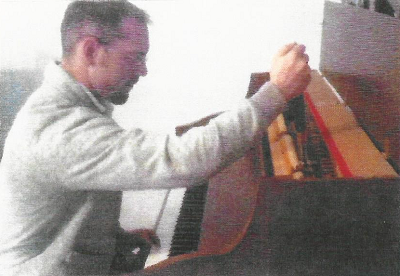 At that age, I also developed a tugging curiosity of the piano's inner workings as I intently watched my father seemingly dismantle the top of our Gulbransen to fish out a marble, where I caught a glimpse of its action. As he struck each key, I watched in awe as something moved and then struck a metal string...over and over, until he found the source of the clicking from the embedded marble. I witnessed the art and mechanics behind these sounds that I had listened to my father create since I can remember, and it was amazing! I've always had a proclivity for fixing things, even as a child, and a passion for helping people. Providing a service such as piano tuning and repair seemed like a perfect fit for the now grown-up little boy who still enjoys fixing things, and helping people; it felt like it was my calling. The next step was to gain the necessary education and skill-set to be able to carry out this trade. Of all the options I had (although not all practical) while continuing to hold my full time job and support my family: moving to a state where I could go to a type of trade school, or land an apprenticeship with a willing and available RPT, or just outright joining the PTG and growing my skills by solely attending a monthly chapter meeting... the one option that appeared to be most feasible, most accommodating, friendly to the pocket book, and allowed me to work at my own pace was to enroll in a correspondence course, of which I chose American School of Piano Tuning. The course was very friendly and fluid, leading me through the lessons step by step, each lesson building upon the previous lessons. The fantastic aspects of the whole process were the knowledge and tips provided from the frist few lessons. They allowed me to begin tuning pianos and receiving payments for my efforts (I advised that payment was not required since I was still learning) which allowed me to more easily afford the remainder of the courses! I've been able to tune and care for numerous pianos over the duration of this class; it has more than paid for itself. I love what I'm doing! Thank you American School of Piano Tuning for giving me anew set of skills and for giving my entrepreneurial spirit room to grow.